I’ve been totally focused lately with wrapping up all my presents for the holidays. In previous years, I’ve wrapped them up in whatever Christmassy paper I had on hand, but they never looked as spiffy as they do this year. 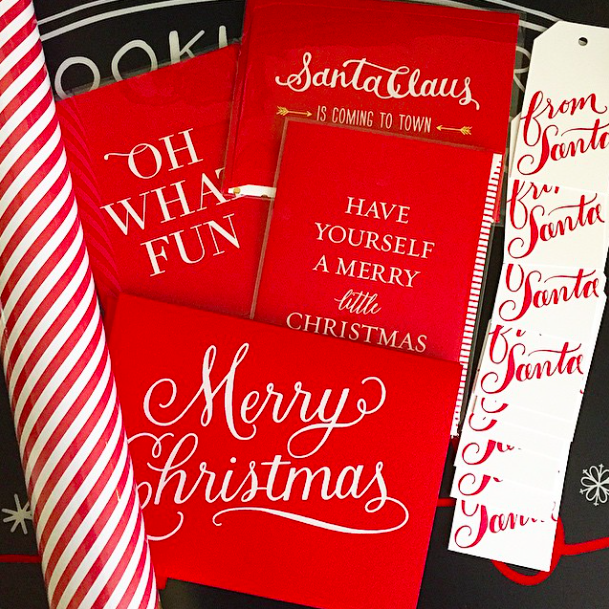 This year, I found the ultimate in Christmassy cards and festive wrapping paper in Sugar Paper LA. I was completely intrigued by Sugar Paper LA the first time I spotted a photo of some super festive cards on Twitter. I kept coming back and visiting my favorite items on the site before making a bit of wrapping paper and Christmas card splurge on Black Friday. I picked up this awesome reversible wrap in cheerful red that shows off candy cane stripes on one side and red and white polka dots on the other. Perfect paper for Christmas present wrapping! 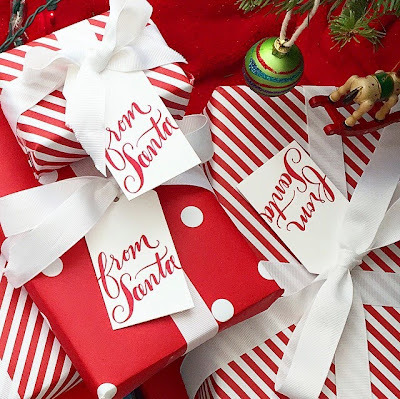 They had such an awesome Black Friday sale that I also grabbed their From Santa gift tags, which classed up all my gifts with their festive and beautiful calligraphy. I also grabbed a bunch of fun Christmassy cards to spread some holiday cheer. Have you checked out Sugar Paper LA? Let me know in the comments below! You are a gifted wrapper!lol. So impressed. Gorgeous wrapping (and paper)! I have never shopped at Sugar Paper but heading there now to see what they have. Your presents look so great, I need to get some wrapping done. I love this wrapping paper! i think I'm going to do everything in brown paper with brown string this year. The rustic sort of look! can you come wrap my presents? seriously… looks amazing! I don't know if my last comment went through… but basically I said you are a wonderful wrapper and I am lazy and have not wrapped ANYTHING yet. I LOVE SUGAR PAPER LA! That needed to be in caps. I love their products. So stunning and classic. Heaven. Hot dang, that looks perfect! That wrapping is AMAZING! I added you on GFC too 🙂 Love your blog! Such cute wrapping and everything! I feel the same way about Christmas wrap… I'm lazy when it comes to wrapping and I just use what ever kind of paper I have. I love your wrapping! You did such a good job! This is lovely. You did a good job here. I'm a sucker for good wrapping. Love it! HOW BEAUTIFUL! Wrapping paper is my favorite part of Christmas! lol. These are beautiful, I always say I'm going to wrap gorgeously and usually I'm just happy it doesn't look like a huge mess. Sugar Paper has a ton of cute stuff. It's hard not to just buy it all!